If a bike’s name is the sole purpose buyers make a purchase, then the Moto Morini 9 1/2 will cast curious looks from a lot of people. Derived from the legendary 3 ½ twin cylinder of the 1970s, the Moto Morini 9 ½ carries a name that belies all the outstanding qualities it offers. From the style to the design and all the way up to its technological innovation, the Morini 9 1/2 is a true ode to the spirit of that Morini machine. 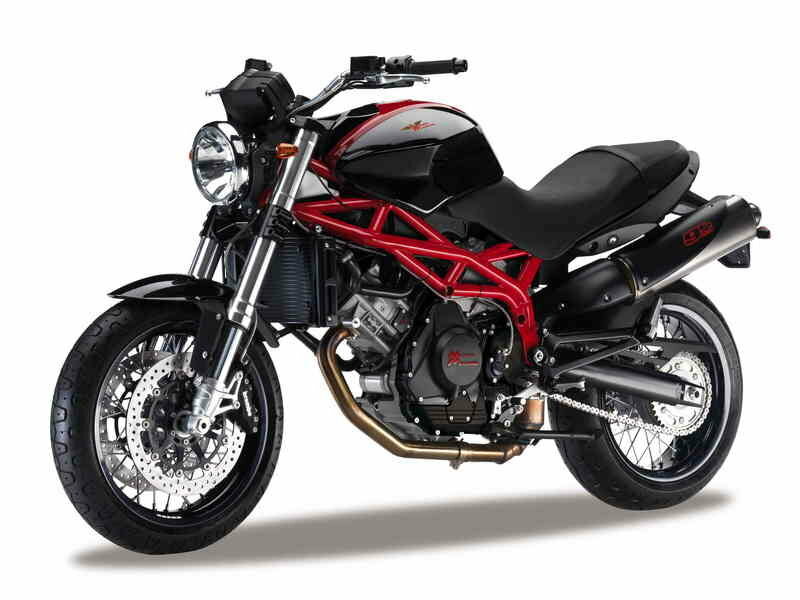 When we look at the features on the Moto Morini 9 ½, it will be easy to be impressed. The first indication of the bike’s tremendous appeal is the power it gets from its 1187 cc Bialbero CorsaCorta twin-cylinder engine that develops an impressive 105 horsepower at 8000 rpm. The layout of the engine is compact, making for a sturdy and impressive ride. Handling is also a big component to the entire 9 1/2 package. The rational approach to the technical solutions and the efficiency to which it handles comes as a result of the tremendous engineering done on the bike’s overall DNA. All told, the Moto Morini 9 ½ combines a classic, reassuring style with the performance of a powerful and excellent motorcycle. The name 9 ½ is an homage to the legendary 3½ twin cylinder of the 1970s. However, it is also acknowledgement of a common thread running between two projects separated in time. The 9½ in fact is the motorcycle whose style, rational design and technological innovation most closely interpret the spirit of that Morini machine. The easy handling, the rational approach to the technical solutions and their efficiency as a result are features that both motorcycles share and that are undeniably a part of Moto Morini’s DNA. How do we define the 9½? A tourer, a naked sport bike, or a motorcycle for daily transportation and city use? The 9½ is all three: it is an elegant road bike with a sporty soul featuring a powerful 1187 cc engine mounted on a tubular trellis frame, evolution of the Corsaro, sport bike par excellence. Those two elements fuse to guarantee a dynamism and lightness completely unfamiliar to the competition. But the 9½ is also an extremely comfortable bike for both rider and passenger, thanks to a virtually perfect riding position, a low seat ensuring comfort for both and the shape of the tank, which is protective and accommodating. All features that, along with its accessorizing possibilities, make the 9½ a bike suited for touring. Agile, manageable, easy to ride, the 9½ can also provide the solution for everyday maneuvering in city traffic. 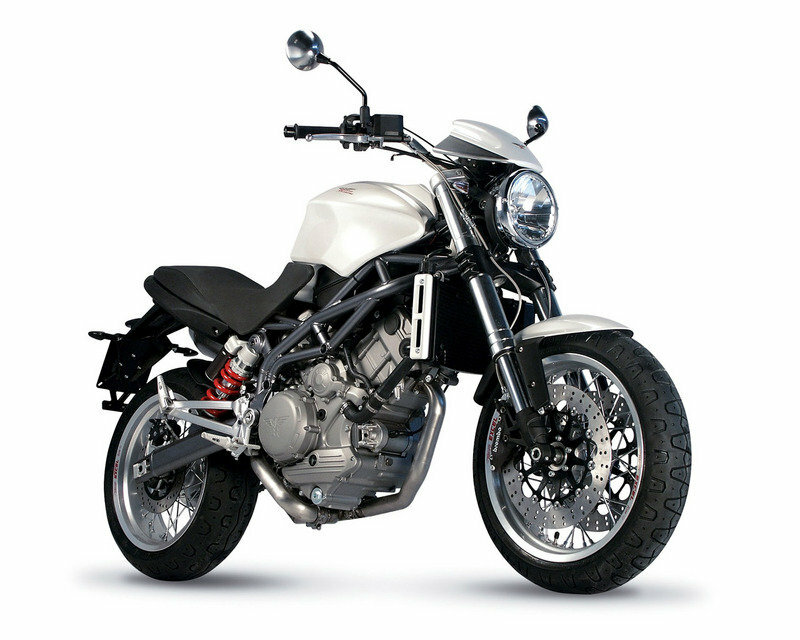 The bike’s aesthetics, the product of Marabese Design, exudes a purity of great appeal. The main element of the motorcycle is the high-capacity tank (21 liters) which stands out for its volume and aesthetic impact. The recesses for the legs are roomy and the concave form in the lower part lightens its appearance, lending it a distinct personality from a frontal view. Its upper part features a clean surface that has been inserted with strips called “braces” that form a perfect arch. The wide seat practically fuses into the light tail, making it seem one piece, and the color choices only add to the sensation. Its shape and covering guarantee total comfort and prevent the passenger from slipping forward when the bike brakes. The technical base is totally exposed and is exclusive for the 9½: the frame features an innovative heavily reinforced rear to accommodate a cantilever side shock absorber combined with a strong swing arm with oval-sectioned tubes. The rear of the bike unites visual lightness with utter rigidity both in terms of stability and load capacity. On the righthand side the single silencer, fully reflecting Moto Morini styling, is thermally insulated to an optimum degree. Equally robust is the front of the bike marked by a solid 50 mm fork with increased travel. A high priority has been given to ergonomic features to ensure maximum comfort for the rider and passenger; the high handlebar, the comfortable, spacious seat, the tank that comfortably fits the legs and the position of the rubber-coated footpegs ensure a snug riding position. Components have been selected to create a blend of contrasts that add to making the 9½ a motorbike of exceptional character: the strength of the trellis frame and the elegance of the two-toned tank; the refinement of the spoked rims juxtaposed with the force of the Brembo 320 mm brake system to ensure power and modulation; the muscular Marzocchi fork with 50 mm legs and the use of the cantilever lateral suspension by Paioli with piggy back reservoir; and the totally round front headlamp contrasting with a more hi-tech led tail light. THE BIALBERO CORSACORTA TWIN CYLINDER ENGINE. The 9½ is a large-displacement road bike mounted with the 1187 cc Bialbero CorsaCorta twin-cylinder engine that develops 117 Hp at 8500 rpm. The engine’s layout is compact, strongly characterized by the 87° V layout of the cylinders and by the innovative solution of the integral casing. Compared to traditional solutions, it offers diverse advantages: the stiffness of the whole makes the engine a loadbearing element, serving to simplify the layout of the frame; the ease in assembling and disassembling means that work can be done on the engine both during production and servicing (for example, the lower part of the engine can be opened to give access to the gearbox and crankshaft without the need to disassemble heads from the casing); the pistons and cylinders can be disassembled without opening the casing by using the lateral openings; and there is no longer the need to join the two semi-casings, typical of motorbike engines, which translates into huge benefits for production, service and the cost of spare parts. The engine by Franco Lambertini has been specially conceived for this bike and vaunts thermodynamic features different from those of the twin-cylinder engine designed for the Corsaro. Efforts were made to reduce the intake pipes and the diameter of the valves and to upgrade engine timing, while the compression ratio was increased to improve the progression at low rpm and reduce fuel consumption. The result is a powerful engine — 86 kW with 117 Hp at 8500 rpm — with a high torque – 102 Nm with 10.4 Kgm at 6700 rpm — well distributed over the whole rpm range, one that while maintaining a sporty soul, adapts ideally to the characteristics of the vehicle, enhancing handling rather than pushing performance to extremes. The exhaust system with a single lateral silencer under the seat meets Euro 3 emission standards. Core of the chassis is the trellis frame in high-strength tubular steel by Verlicchi based on an exclusive design by Moto Morini. The structure offers unparalleled solidity which has been additionally stiffened in the rear part of the subframe, a stiffness required for adopting the solution of the cantilever lateral suspension. The values normally assigned to wheelbase, steering rake and trail are compact, especially considering the fact that we’re talking about a bike with a 1200 cc engine capacity. Because of the harmony achieved in the tuning of the components, the product of this “alchemy” is immediately perceived from the outset: the weight, already reduced to just 198 kg in running order, magically disappears once the bike is in movement and the swift response during cornering never produces undesired instability, even at the highest speeds. The function of the frame is assisted by top-flight suspensions. At front is a mighty Marzocchi Magnum with 50 mm diameter legs, with exclusive lightweight plates in light alloy. The visual solidity reflects a likewise solid performance, ready to conform to the smallest bumps on the road or respond to the hardest braking. The rear fits a powerful swingarm, made with a 150 mm diameter oval-sectioned tube, aided by a suspension with piggy back reservoir, fully adjustable in rebound and compression. Excel spoked rims with aluminum alloy channel enable mounting of tubeless tires for travel in maximum safety. The Brembo systems we have chosen guarantee powerful, progressive braking, allowing the rider to develop a heightened sensitivity and master this challenging part of the ride. The pair of 320 mm semi-floating discs at front is operated by axial calipers with four pistons with differentiated diameter, a solution that responds to a specific technical requirement – to provide safety through great modulating capacity and sheer power. Too often racing systems that are transferred to road bikes produce reactions that are abrupt and difficult to control, especially on roads open to traffic and on surfaces offering poor grip. While representing Italian mechanics at their best, the 9½ reflects the giant steps made in the field of electronics. The CAN line serves to transfer the information between the Magneti Marelli engine control unit, the fully equipped instrument panel with onboard computer and the latest generation sensors. Included among the functions of the instrumentation, the rider can refer to two different trip meters, including average speed and lap time, but also check outside temperature, engaged gear, clock and maintenance intervals. Starting is automatic: just a short press of the button gives the cue to the CPU to start the electric motor until the V-twin comes to life. Even the old lever of the starter is a distant memory thanks to the sophisticated mixture enrichment system controlled by the stepper motor in response to the climactic conditions. Not with standing this, technology is never invasive: the rider never loses control of the situation and even from an aesthetic standpoint, the cables disappear from view and most components are neatly ordered in the under-seat compartment. Both the strong front headlamp and the led one in the back turn on automatically upon starting in accordance with the most recent road rules. The fuel tank, with its prestigious two-toned finish echoing the glorious Morinis of yesteryear, is built in shock-proof nylon. With a 21 litre capacity, it can be lifted to permit access to the large filter box underneath. The exhaust system gives an unmistakable look to the bike thanks to the Termignoni silencer and its powerful sound. Aesthetics aside, however, meticulous design matched with closed loop technology with three-way catalytic converter and oxygen sensor has resulted in emissions that fall under the limits established by the rigid Euro 3 standards. The name 9 1/2 is an homage to the legendary 3 1/2 twin cylinder of the 1970s. However, it is also acknowledgement of a common thread running between two projects separated in time. The 9 1/2 in fact is the motorcycle whose style, rational design and technological innovation most closely interpret the spirit of that Morini machine. The easy handling, the rational approach to the technical solutions and their efficiency as a result are features that both motorcycles share and that are undeniably a part of Moto Morini’s DNA.